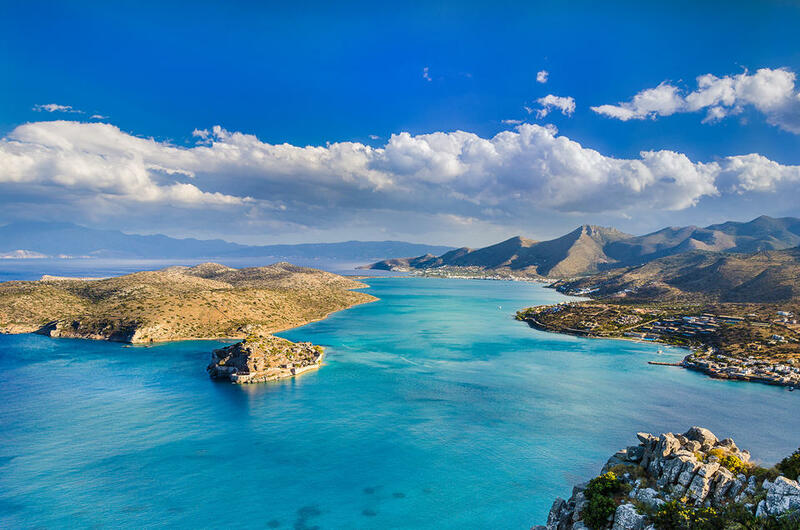 Although Elounda is on the north coast of Crete, it faces east because at that point Crete's shoreline takes a 25 kilometer-long north-south turn. 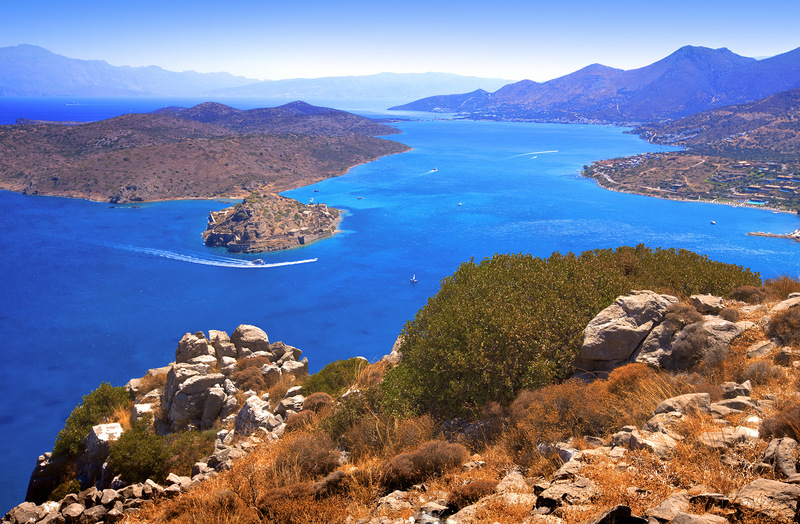 Because of this eastern orientation, and the sheltering effects of the Spinalonga Peninsula, Elounda is not affected by the meltemia, the strong northerly winds that routinely blow across the Aegean during the summer. About 70 km east of Heraklion, and 11 km north of popular Agios Nikolaos, Elounda is a group of luxury resorts on Mirabella Bay, and a magnet for high rollers. Rich and famous Greeks, and figures from the world of entertainment as diverse as Leonardo di Caprio, U2, and Lady Gaga have visited. Andreas Papandreou, prime minister of Greece during the 1980's and 90's, would vacation here once a year. Arab princess have vacationed in Elounda, as well as Russian tycoons and VIPs from all over the world. Elounda was the setting of the BBC TV series Who Pays The Ferryman? (1977) created by Philhellene Michael J. Bird, for Belinda Jones's 2008 travel novel Out Of The Blue, and of Beryl Darby's 2013 semi-fictional account of a leper patient on Spinagola island (an islet just north of Spinagola Peninsula), entitled Yannis. Bird's BBC production in particular was responsible for a surge in tourism in Elounda in the late 1970's and early 1980's. Additional interest in Elounda was created with The Island, the 2007 bestselling novel by English writer Victoria Hislop, partly set on Spinalonga Island. Spinalonga Peninsula is connected by the thinnest strip of land to mainland Greece. It is also called "Kolokytha Peninsula." "Kolokithi" in Greek can be a gourd, a pumpkin, or a zucchini. It is also called "Kalydon," just to confuse things further. "Kalydon" is a more recent name, and is an effort to "Greekify" the peninsula's name, as Spinalonga is the name the Italians gave it. Day trips are offered to Spinalonga Island, which has a deserted 16th century Venetian fortress and town, and was Greece's leper colony during the 20th century, and Hilsop's subject matter in her novel. The colony opened in 1913, and closed in 1957. Spinalonga has about 1500 visitors a day during the summer, making it the 2nd most popular archeological destination after Knossos. A major resort area, Elounda is full of super-expensive villas rentals, some with butler service, renting for multiple thousands of Euros a week. It is said to have the most 5-star hotels in Greece. For the rest of us, there are much more affordable options with prices as low as 30 Euros a night and even less for the more enterprising. Elounda has a very nice, compact, 100 meter-square harbor housing local fishing and excursion boats, and the occasional yacht. Despite the many buildings put up in recent decades to accommodate the tourist trade, the village retains much of its original character. If you take the road north to Elounda from Agios Nikolaos, 12 km south, there is a climb to the top of a small mountain which affords a tremendous panoramic view of Mirabello Bay, its islands, Elounda, and, to the east, most of eastern Crete. 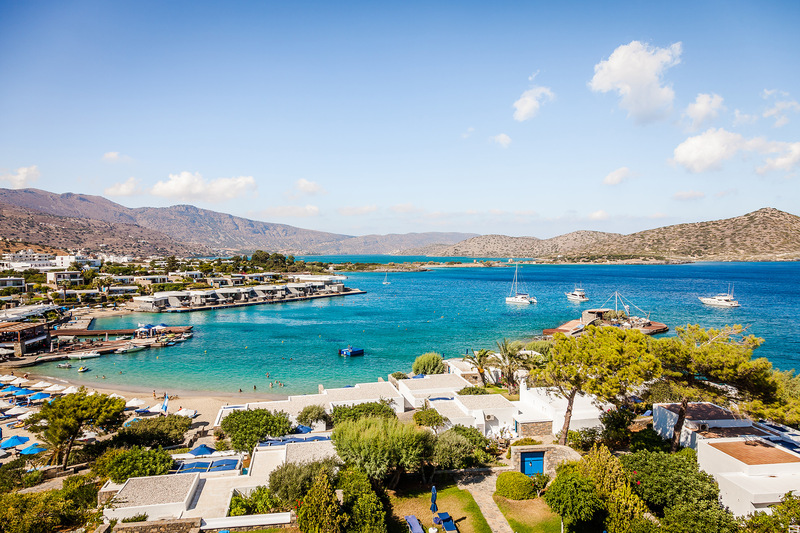 Elounda is built near the site of the ancient Olous, which is now a sunken city due to seismic activity on Crete. Part of the city (mainly wall remnants) is visible off the causeway connecting Elounda to Spinalonga peninsula. There are a number of villages nearby, such as Plaka, Mavrikiano, Skisma, Epano Elounda, which give one more the flavor of a Crete that is slowly disappearing. Elounda's main beach is next to the harbor in town, and is organized. There are loads of places to eat and shop a stone's throw away. The beach tends to get crowded in high season. To the east is another beach, not far from the isthmus or causeway leading to the peninsula. Again, it's organized, but it's smaller and cozier than the town beach. 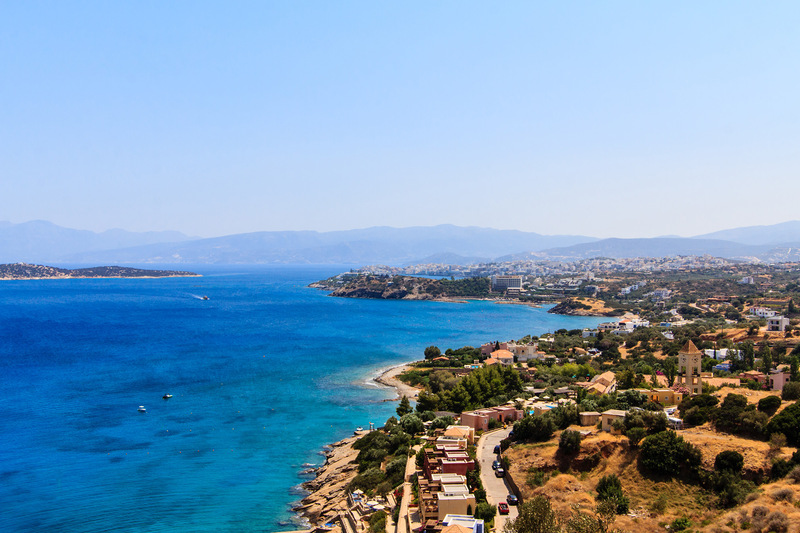 On the peninsula you'll find Kolokytha Beach a few minutes' walk away. It's just past the church of Agios Loukas, on a path after the church. It's not an organized beach so you'll have to bring your own umbrella. There may be nudists sunning on the flat rocks to the northwest. Just a bit north of Elounda is Dreros Beach, which has pine trees fringing its sand. There is a cafeteria nearby, and sun beds available. Just beyond Dreros is Plaka Beach, which is just opposite the islet of Spinalonga. Not necessarily for those seeking a vibrant nightlife (nearby Agia Nikolaos might be better for that), Elounda is blessed with a stunningly beautiful sea, which has been described as, when swimming in it or viewing it from a distance, "like dreaming with open eyes."